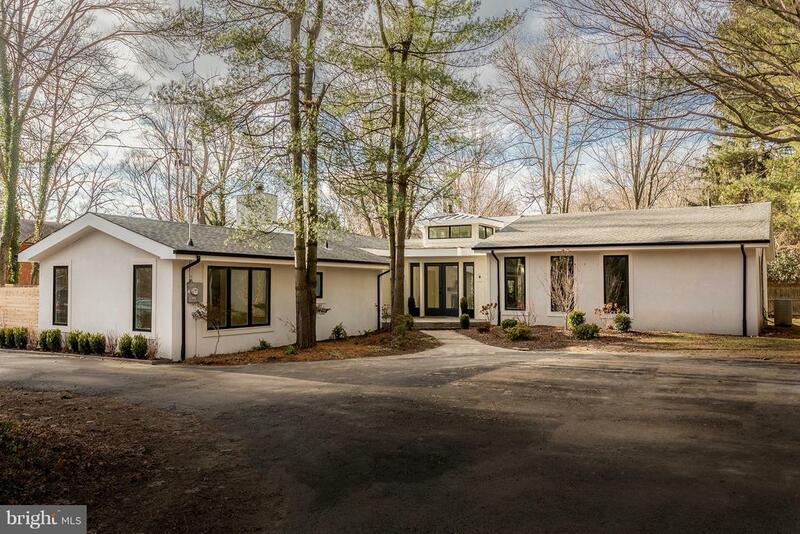 We are very excited to offer this spectacular contemporary home, having undergone a comprehensive custom renovation, in a desirable Chestnut Hill location. This magnificent home is the result of a developer with over 20 year~s experience teaming up with Green Rhino, a design firm with a clean, comfortable, and elegant style, and Custer Kitchens, a kitchen and design company that has been behind countless high-end kitchens in the Chestnut Hill area over the last 30 years. Sophisticated, clean lines highlight and enhance an open floor plan, with exceptional appointments. Our latest offering is just the turnkey, one floor lifestyle so many buyers desire. Enter the foyer with volume ceiling and glass cupola, radiant flagstone floor, leading to step-down living room with fireplace. The custom, gourmet, eat in kitchen, offers Jenn Air appliances, large island and ample counter space with honed marble countertops, fireplace and separate dining area. Family room with fireplace opens to flagstone terrace. Master bedroom suite opens to private terrace, complete with large walk-in closet, and master bathroom Designed for todays living in mind the four additional bedrooms and 2.5 bathrooms. Additional features include brand new HVAC, new windows and doors, hardwood floors throughout. Situated on a .45 acre lot, the beautifully landscaped grounds, including a handsome stone wall, originally part of the famed Krisheim property. Quite simply an exceptional property within walking distance to the Chestnut Hill village, schools and the Wissahickon trails, and a short commute to Center City.